How Does Water Purification Tablet Work? How to Choose The Best Water Purification Tablets? In order to have a comfortable and enjoyable camping trip, it’s vital for you to prepare a sufficient amount of supplies. Among the necessities, clean water to consume is extremely important for you stay hydrated. Dehydration is devastating to your muscle strength if you let it happen therefore proper preparation is essential. In the case that the trip only lasts for a short duration then you can carry enough water on your own. However, if it’s a multiple day trip through uninhabited lands, you probably have to look for other water sources on the way. This is when having the best water purification tablets around will come in handy. In the trip, you may find springs and ponds which appear to be safe to drink from the outside. Yet you must remember that you cannot detect harmful microorganism in the water with your bare eyes. Before you are able to consume waters in these places, you have to purify them first, ideally with purification tablet. Should you intend to use the tablet method in the upcoming trips, this article is for you. Below are helpful information and a couple of excellent product for your consideration if you’re looking for the best water purification tablets to prepare for your camping trips. 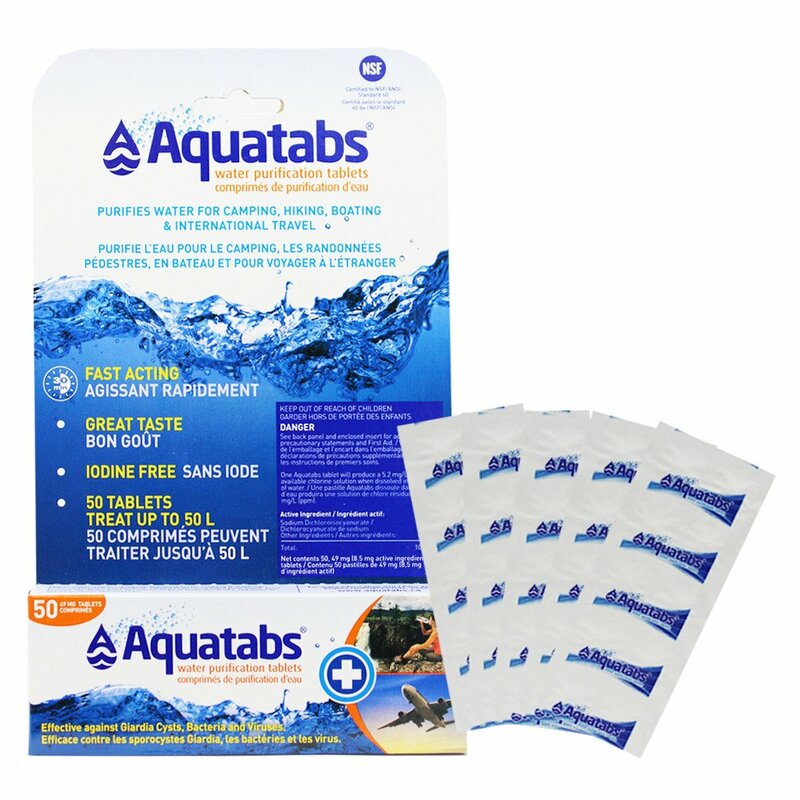 Able to effectively treat up to two liters of water per tablet in half an hour, Aquatabs tablet is among the most popular products. This is undeniable one of the best water purification tablets available on the market. It destroys all common bacteria, germ and virus living in outdoor water sources. The taste of water after being purified is perfectly acceptable without causing discomfort. Many health organizations employ the tablet to good use in their operations because of its excellent qualities. Depend on the conditions, Aquatabs tablet shelf life is around five years which is commendable given its affordable price. Filtering is necessary nerveless when the water is too dirty or noticeably murky since harmful microorganism may hide in dust particles and organic matter. The purifying effect of the Aquatabs tablet could be not up to specs if you use it right away in such situations so be careful. If a filter is not immediately available, pieces of cloths are enough for a temporary measure, even your T-shirt will do. Whether it’s an emergency occasion or daily uses, Aquatabs tablet shall not let you down, it’s compact, light, high efficiency and quite easy to transport. Iodine is great for purifying water but it leaves the water in a rather strange taste which is not exactly easy to drink. 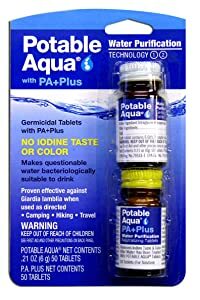 But if you appreciate Iodine, Potable Aqua® with PA+ Drinking Water Germicidal Tablets got what you need to deal with the aftertaste. Come in a set of two bottles, the idea is to purify the water with the Potable Aqua while letting the PA+ treat the flavor. The PA+ tablet is based on Ascorbic Acid (Vitamin C) so it’s safe to use and work great at removing the Iodine taste. You should not use the set on a continuous basis though. The bottles are nice but the price tag is high considering the number of tablets provided in the set. However, the quality of the Potable Aqua® with PA+ Drinking Water Germicidal Tablets is undeniable. Customers are all satisfied with the purifying result of the set and the amount of water treated each time the tablets are used. For camping and hiking purpose, this is a good way to obtain drinkable water in the middle of nowhere. 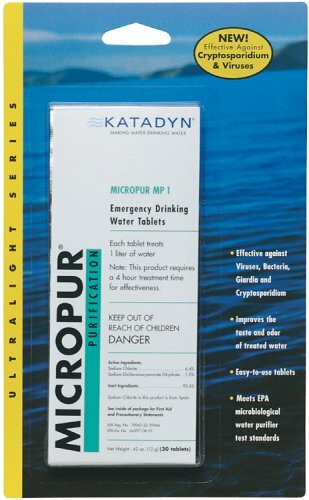 Among the best water purification tablets that we can buy on the market, Katadyn Micropur MP1 is another product we would like to mention on the list. Separately packed to reduce the risk of contamination to the minimum, the Micropur MP1 Purification Tablets main focus is safety. The waterproof packaging style also makes it easy to access the tablet without much difficulty while keeping them dry. Come from the well know Katadyn brand that is specialized in filtering and purifying products, MP1 tablets can kill the toughest of microorganism. Yet the time it takes to do this might be considerably longer than other kinds of tablets since it’s not really strong. One tablet can treat one liter of water so with one pack, you can get a lot clean water to use for the entire trip. The purified water doesn’t have a bad taste but it could end up with a yellowish color in certain cases. Some customers may be turned away by such a sight but the water remains perfectly safe to drink however. Due to a possibly long time requirement, it may be wise to plan your journey logically. Employ the tablet even if you don’t intend to consume the water at the moment in order to ready it for later usages. Not as strong as other products. At a very compact size, a bottle of Polar Pure can treat an impressive amount of nearly 1,900 liters of water. It doesn’t require a lot of space and weight little. Another great thing about this water purification solution is that it remains effective for more than a decade. While Polar Pure is an Iodine based product, the waters it purified don’t have an unpleasant taste so it’s totally drinkable right away. The use of Iodine ensures that it will eliminate all the bacteria and alike exist in the water. Filtering is required if the water contains dirt and organic matter though. Polar Pure is technically a liquid solution but it got a competitive performance compared to the average purification tablets. The built-in thermostat is quite helpful in order to determine to correct the necessary amount to use in the current setting. 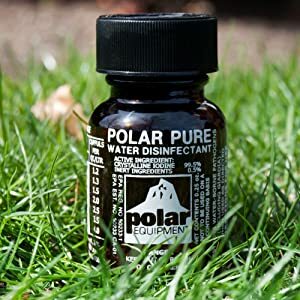 In the usual case, about two drops of Polar Pure is sufficient to treat a liter of water. High efficiency and long shelf life, it’s a good item to bring with you into the wild. The solution works fairly fast so you can have clean water to use whenever you want. There are complaints about products evaporate on their own. Talking about the best water purification tablets the Able to treat one liter of water with each tablet, one pack of Aquamira Water Purifier Tablets will keep you hydrated for a 5-day trip. It utilizes chlorine dioxide as the main purifying agent that is rather effective at killing microorganism without creating harmful by-products. The purified waters don’t have a weird color or unpleasant flavor so it’s easy to consume. Given enough time, Aquamira tablets shall eliminate all the pathogen lurking in the water and make it completely safe to drink. Its container pouch is reusable as well. A product of Israel origin, Taharmayim is an excellent option when cleaned water is in short supply. Each tablet can treat one liter of unknown water from outdoor lakes, rivers and so on. The number of tablets in each pack is generous as well with up to fifty tablets. You shall have no trouble staying hydrated water as long as there is a water source nearby. 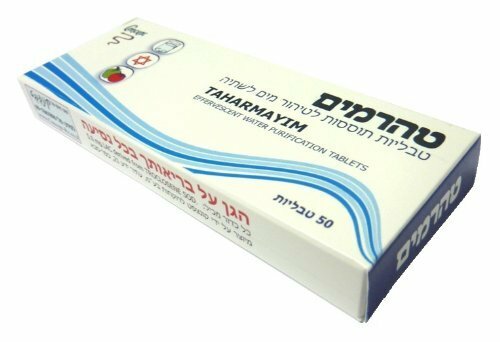 All you have to do is to put one Taharmayim tablet into the suitable amount of water then wait for less than half an hour. After that, the water should have been completely purified and you can drink to your heat content. 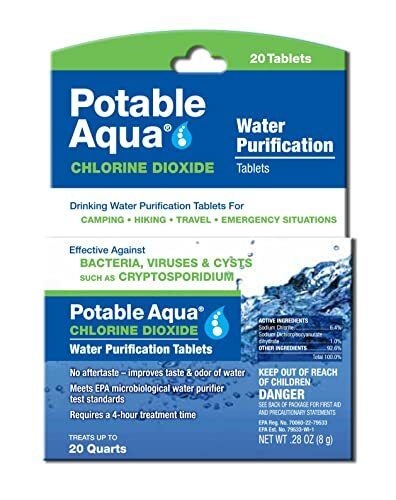 Available in packs of twenty and thirty, Potable Aqua Chlorine Dioxide Water Purification Tablets can treat lots of water efficiently and effectively. It works great against a variety of dangerous microorganisms which inhabit the natural water sources. Though the time it takes to treat the water is not exactly short, the tablet did offer you a safe way to get clean water. With proper timing, you can have a comfortable and uneventful camping trip using this product when water is not good. There is no unpleasant odor so it’s not hard to drink purified water. To put it short, water purification tablets contain one of three substances to purify the water: iodine, chlorine or chlorine oxide. They all work more or less in the same way which is to eliminate microorganism in the water. As a result, you can drink the purified water without possibilities of contracting waterborne diseases such as cholera, dysentery and typhoid. The time it takes to treat the water along with the taste after that could vary from one type to another though. Generally, water purification tablet is a great way to obtain drinkable water in the wilderness. In the first section of the article, we already provided detailed reviews about 7 best water purification tablets. These are great performing products which are highly recommend by most survivalists, campers and hikers. They all come with quality and safety but the characteristics vary from one to the other making it a little bit confusing for users to choose which water purification product suits them the most. When it comes to the purifying result, Iodine based tablets are slightly better than their Chlorine based counterparts. Yet Iodine has several notable issues which require your attention before you can use products that contain it. You have to use a dark bottle because Iodine is light sensitive and sunlight exposure shall affect its performance. Water purified by Iodine has a strange taste so it may be hard to drink. Finally, Iodine based products are unsuitable for children, pregnant women or people with certain health problems. That is why it’s important to choose the right brand water purification tablet which suits you the most. Buying on a whim could cost you money for negligible gains or even a threat to your well being. If you want your purchase to be well-spent money, research your options thoroughly before making the final decision for the best water purification tablets. Only use tablets still in their airtight packaging without sights of being damaged. The effectiveness of the water purification process is substantially reduced if the tablet comes in direct contact with the outside elements. It’s a good idea to read through the instruction to fully understand the characteristic of the tablet you about to use. Don’t forget to pour out a bit of purified water to treat the mouth of the bottle. Contaminated water might linger at that part and will travel with the purified ones into your body when you drink. And those are some of the best water purification tablets you can buy for the money, see anything you like? The last thing you want is to be dehydrated without drinkable water in sight. Of course, you can’t simply buy water purification tablets without getting to know them first. The above should be enough to let you have a general idea about popular brands on the market. Crosscheck their characteristics with your preferences then you can make an informed decision.